After fourteen hours of play, a champion has been crowned, in the new $1,000 Super Turbo Bounty Event here at the World Series of Poker. 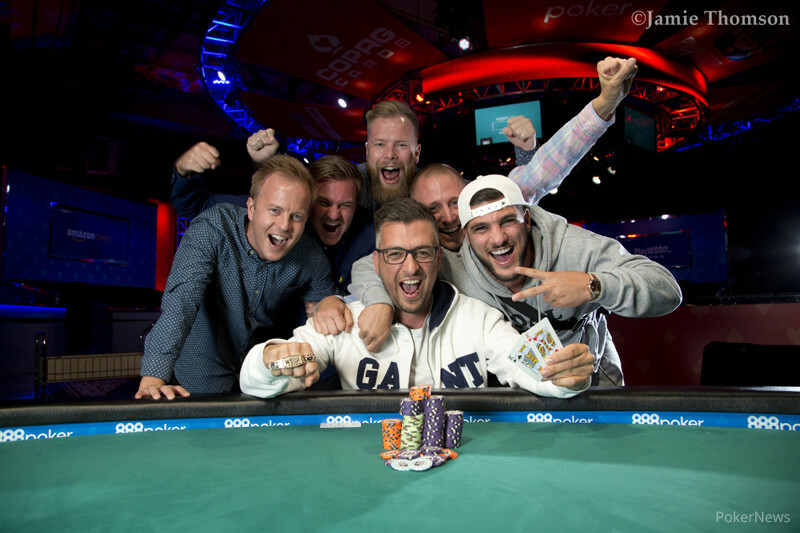 Sweden’s Rifat Palevic outlasted 1,867 players to be crowned champion, collect his first gold bracelet, and pocket $183,903 for his efforts - and it was all done in a day. The structure saw players start with 5,000 in chips and receive $300 for each player they eliminated throughout the day. Twenty-minute blind levels saw the massive crowd dwindle down to just nine in 13 hours of play. The final table then lasted only 54 hands in just over an hour. First to fall was Victor Kim. His pocket sixes were counterfeited against Robert Heidorn’s ace-jack. With less than a big blind left, he chose to muck a few hands, before falling three hands later. George Dolofan was next to fall. He firstly had his pocket queens cracked by Palevic’s when the river made a flush. Shortly after his queen-ten lost out to Palevic’s ace-king. Gavin O’Rourke (7th), Joe Montervino (6th) and Rick Hollman (5th) then fell in the space of ten minutes and the field was cut to four in no time at all. Ten minutes later, Robert Heidorn committed his chips in with ace-deuce and was out-kicked by Ryan Olisar's ace-four. Olisar faded a gut-shot straight draw on the river and Heidorn was gone. Australia’s Dean Blatt fell in third place when his pocket fours were no match against Palevic’s kings. He was left with just a 5,000-chip, and fell in the following hand. Heads up saw Olisar hold a 2:1 chip lead over Palevic. Palevic mentioned a potential chop but Olisar was happy to play it out. Eight hands later, Pelavic had captured the title. In the final hand, Olisar moved all in for his last 1.5 million with and ran into Palevic’s pocket kings. No help came and Olisar finished in second place, collecting just over $113,000 for his efforts. After taking down the tournament, Palevic was asked how he felt about the whole experience. He said that this tournament was perfect for his style of play and he loved everything about it. His crew of friends from Sweden gave him so much positive energy and carried him to victory. He had a big gap between playing because of his daughter and wife and their schedules and hadn't been able to focus on poker beyond playing in Sweden. He loves America and loves coming to play here and in Las Vegas. Hand #54: Ryan Olisar moved all in for about 1,500,000 and Rifat Palevic called. The board ran out and Palevic collects the last bounty of the tournament and keeps his own as he is the Event #39: $1,000 No-Limit Hold'em Super Bounty Turbo champion. Hand #50: Rifat Palevic moved all in and Ryan Olisar folded. Hand #51: Palevic got a walk. Hand #52: Palevic moved all in and took the pot pre flop. Hand #47: Ryan Olisar moved all in and Rifat Palevic folded. Hand #48: Palevic moved all in and Olisar called. Palevic showed and Olisar tabled . The board ran out and Palevic vaulted back into the lead with his pair of nines. Hand #49: Palevic got a walk. 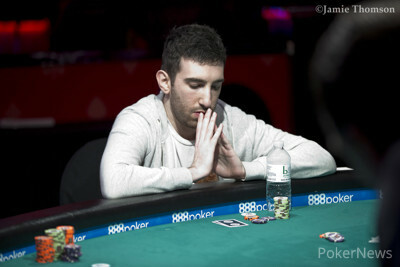 Hand #46: Dean Blatt was all in for just 5,000 before the hand started. Rifat Pelavic called from the big blind. Ryan Olisar checked his option from the small blind. Both players then checked down the board. Olisar showed for nine-high. Pelavic then flipped over for a pair of deuces. Blatt then peeled his cards one-by-one, and exposed for king-high, and was eliminated in 3rd place. Hand #45: Dean Blatt moved all in for 1,360,000 from the button and was called by Rifat Palevic in the small blind who had 5,000 less. 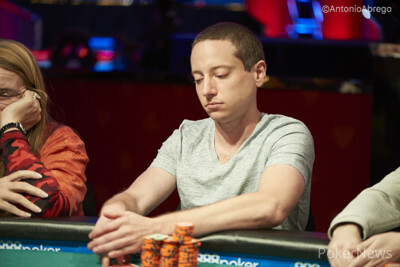 Blatt was dominated, and would find no help from the board, dropping to just 5,000 in chips. "He's back to starting stack," joked Scott Davies from Blatt's rail. Ryan Olisar moved all in and took it down pre flop. Ryan Olisar gets a walk. Rifat Palevic moved all in and took the pot pre flop. Olisar moved all in and Palevic called. The board ran out and they chopped the pot. Hand #37: Ryan Olisar moved all in from the small blind and Dean Blatt called in the big blind with 1,110,000 remaining. Blatt tabled and Olisar showed . The board ran out and Blatt got the much needed double. Hand #38: Rifat Palevic got a walk. Hand #39: Rifat Palevic moved all in from the small blind and took it down. 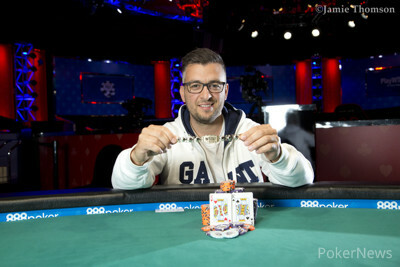 Hand #40: Rifat Palevic was on the button and moved all in. Ryan Olisar was in the small blind and called. Olisar tabled and palevic showed . The board ran out and Olisar got a huge double to take over the chip lead and open up a gap on Palevic.